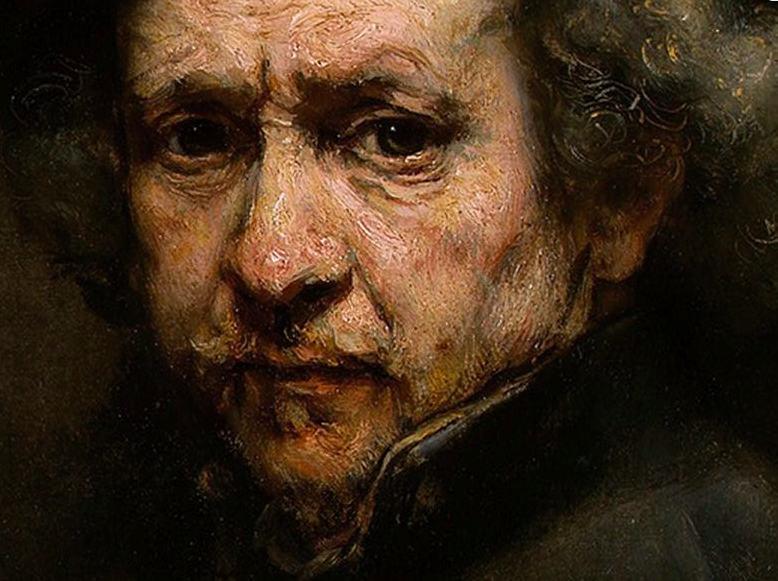 Why Should Landscape Painters Study Art History? 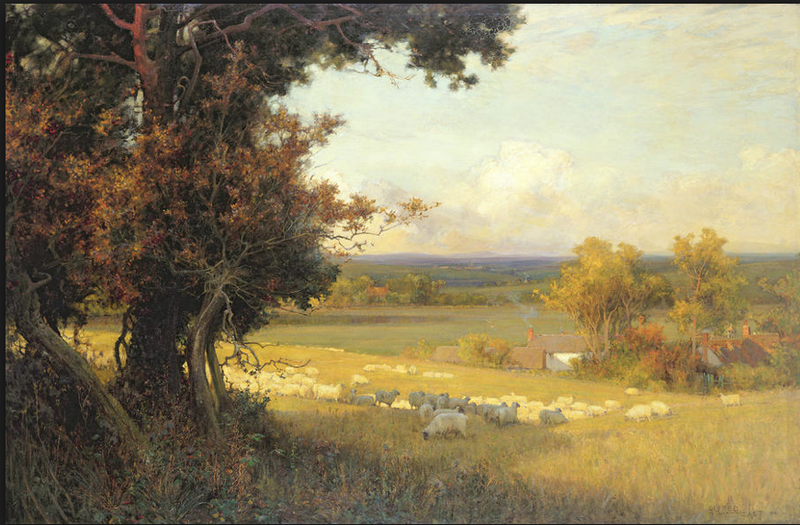 It’s surprising how many landscape painters don’t have a working knowledge of the art history of landscape painting. With the prevalence of social media today it’s easy to ‘follow’ contemporary artists whose work you admire, and many of us do. 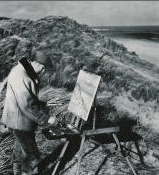 But, a far smaller number make the effort to connect with their artistic heritage as landscape painters. Perhaps you remember that course in college—the dark room with an endless stream of images of gothic cathedrals or renaissance paintings flashing on a screen over the low hum of the slide projector, the droning voice of the professor, while you tried not to fall asleep? Maybe you vowed never to do that again! There is no doubt that art history. can seem like a very dense subject. Most traditional art historians employ a formal analysis which derives from Heinrich Wolfflin’s Principles of Art History, published in 1915, which was an attempt to create a methodology of examination and analysis of stylistic changes that could be used to classify the art of any given period in art history. By applying the overarching principles the idea was that an art historian could not only utilize language that would have specific meaning to all scholars but which would cover the vast array of stylistic differences that might be encountered. Entire college courses are devoted to Wolfflin (I’ve been there and done that) but suffice it to say that while these concepts can be very useful, they also can have led to thinking about art history as an episodic story with winners and losers, depending on the prevailing tastes of the time. Whole art movements can be relegated to the ash heap if they are deemed out of step with the “march of development” (Medieval, Renaissance, Baroque, Neo-Classical, Rococo, Realism, Impressionism, post-Impressionism, Modern, Post-Modern, Conceptual…..) as decreed by the official version of Western art history. In fact, almost all of 19th century American landscape painting was in exactly that position until just a few short decades ago! So, we have to keep in mind that the official version of art history does not necessarily tell the whole story, and the desire to find influences and affinities in the art of earlier times or art that is concurrent with the period under study is sometimes strained beyond the point of usefulness. Secondly, as artists, we approach this work from a different perspective. What we seek to know and understand is something beyond the recitation of facts, a cataloging of influences or affinities or even biographical facts (although those are all things we should know). We want to know what made this artist make this art at this time, and what if anything we can learn that will help our work. We want, most of all, to look at the work with an understanding of the person who made it and his or her time, and to see it with fresh eyes. We want not to only look on art with the cool eye of formal analysis, but to be riveted by it, to fall in love with it, and to acquire some of its power. As a landscape painter, I could hardly keep from laughing out loud when I read that. How could it be any other way? How as landscape painters could our work not be formed by the “power of the natural experience”? The fact that Novak felt compelled to concede that it just might be the case, tells us about the different perspective that we bring to the study of art history. And yet, art does also come from art, and if you don’t know about that lineage, you are missing out on a big part of what it means to be an artist. It’s like deciding to take up classical piano without ever hearing the music of Beethoven or Mozart! 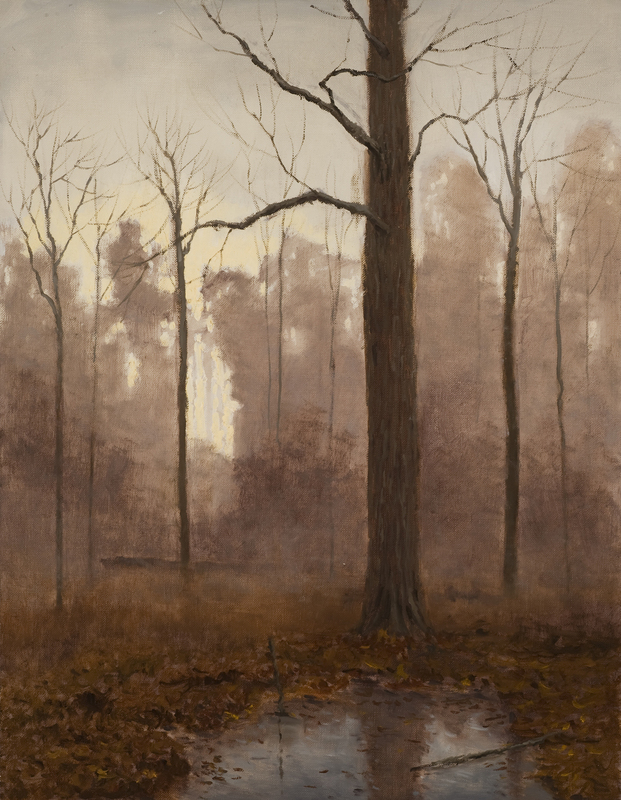 Our online class 19th Century American Landscape Painting starts Friday, April 26. Join us and we’ll try not to put you to sleep! 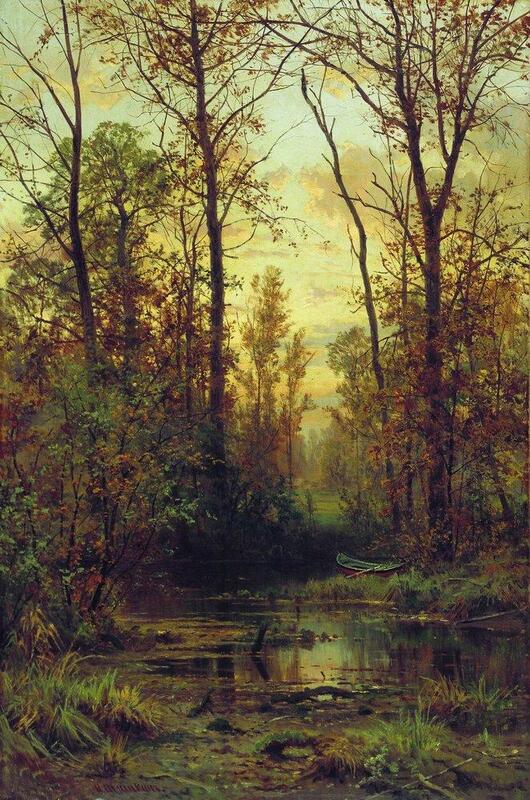 Author deborahmparisPosted on April 20, 2019 April 20, 2019 Categories Art HistoryLeave a comment on Why Should Landscape Painters Study Art History? Landscape painters need to have a good understanding of the importance of value in successfully depicting the landscape on a two dimensional surface. In order to have our painting ‘read’, that is to show the planes of the landscape as well as its depth, atmosphere and scale, proper values are essential. As we’ve previously written, Carlson’s Theory of Angles is a great place to start as an overarching concept for understanding values in the landscape. But, it is only a starting point! Another layer of complexity is added when we think about how to depict the varying atmospheric conditions, times of day and effects of light that we observe in Nature. Again, values are the key to success here. And, we often refer to this process as ‘keying’ the landscape. 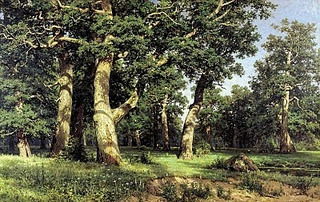 For example, in order to key your landscape painting to depict a sunny day as opposed to an overcast day, you must learn to shift the value range up or down the value scale as well as understand the proper value steps between the light and shadowed parts of each plane in the landscape. It sounds complicated, but with careful observation and application of some basic concepts, this knowledge will allow you to paint what you see more accurately and also change the key of your landscape when painting from memory or imagination. This combination of observation + knowledge, gives you the ability to paint any light effect or time of day. Here are a couple of examples. In this painting by Willard Metcalf (American, 1858-1925) we see a beautiful effect of bright sunlight. When we convert the painting to greyscale, we can see that there is a wide range of values from light to dark. Also, the lights and darks within each plane are several steps apart. Look at the grass for example and notice that there is a 2-3 step difference in value from light to shadow. In this painting by Claude Monet we are treated to a beautiful effect of low light and an overcast sky. The colors are more muted and the values closer together. 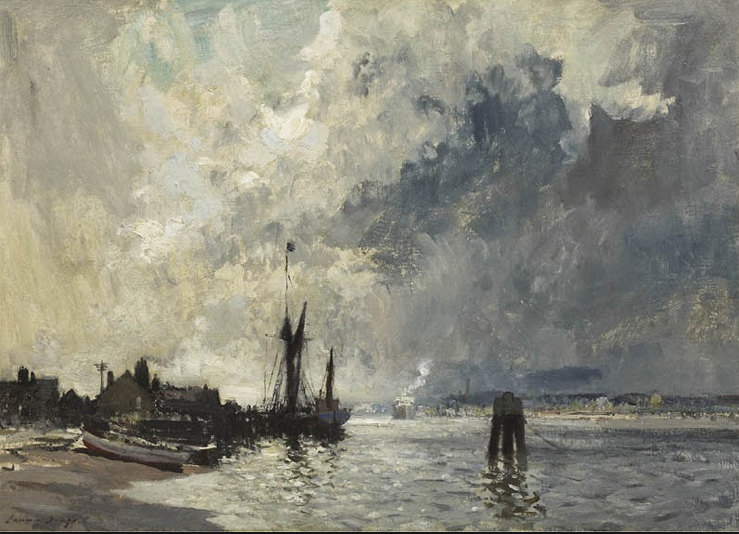 The greyscale of this painting shows a close value range and a shift toward the darker end of the value scale. 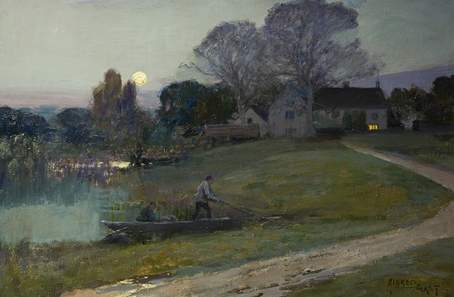 The shifts between light and dark in the foreground are less than than a step apart, and the white sails of the boat are a step or more darker than the lightest value on the scale. By understanding both the value range and the steps between light and shadow found in each light effect or time of day, we can learn to key our landscapes effectively. P.S. Our first online class of the year Understanding Values in the Landscape starts January 5th! Master the use of values in landscape painting and learn how to key your landscapes successfully. Also, our 2018 schedule of online classes is now posted and open for registration. There are Class Bundles available to help you save. Join us! Painting students are often encouraged to think of Nature in terms of shapes of color and value. That is a useful idea because it helps to build a solid foundation of design, value structure and drawing into our paintings. But, what to do after our flat color shapes are in place and we wish to impart some of the variety and life we see in Nature? A most useful idea to think about is the concept of gradation. Gradation is an idea that applies to all of Nature. As John Ruskin, the great 19th century teacher and art critic, wrote in Modern Painters, every part of Nature is in a constant state of variation and gradation. ” the two evil extremes of insufficiency and affectation ” <sigh> Ruskin – you gotta love him! In fact, all of Chapter 6 in Carlson could be described as an ode to gradation- so if you want to understand gradation, start there. Read it! Our challenge as artists is to show this beautiful quality of Nature. So, this is why the idea of creating variety in color through understanding shifts in temperature, chroma and value is so important! It goes to the heart of being able to depict Nature effectively! There are several ways to do this. Impressionist painters chose to use broken color- exaggerating the gradations in order to emphasize the visual impact they create. Monet is a good example of this approach. Ruskin might have considered this “an evil extreme of affectation”. ￼ As opposed to this painting by Isaac Levitan which takes a more tonal approach and where the gradations are more subtle and naturalistic. P.S. Our new six week online painting class The Strong Start begins on April 15. As its name implies, this class is designed to help students start out with a solid structure for their work, and give them proven strategies for successful work outdoors and in the studio. A Strong Start is the first step to a strong finish! Join us! John Constable, one of England’s and the world’s most revered landscape painters, spent his career making drawings and painted studies from which he then worked up his famous “six footers”. Constable’s work was enormously influential in France with the Barbizon school of landscape painters, and eventually the Impressionists. 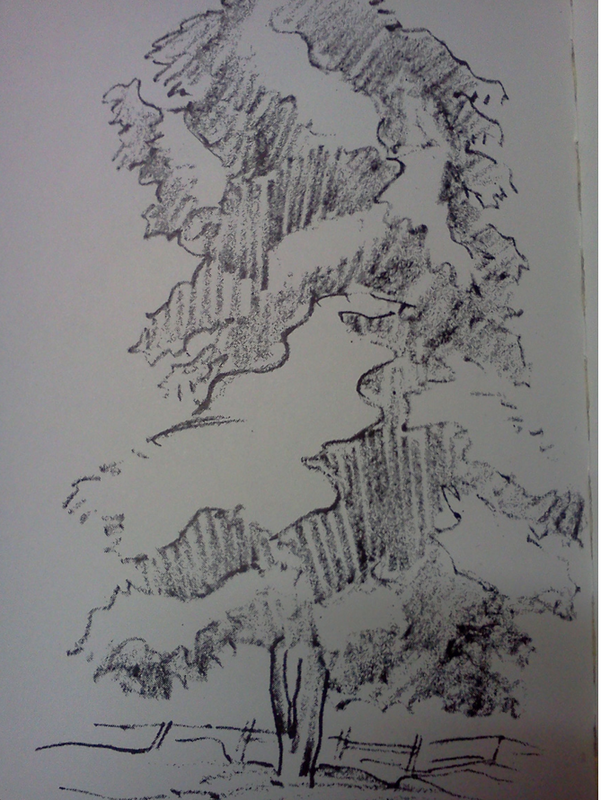 Here is a typical drawing of his and it is instructive for us when learning to see and paint masses of foliage. As you will note, Constable has carefully delineated the values within the foliage masses and used lights, midtones and darks to create form. These areas are not randomly created- they are based on the architecture of the tree. But, you will often have to “mass” these areas of value to create a solid look to your tree. In most cases, there will be many more value changes than you will want to describe. To do so will break up the volume of the form too much. 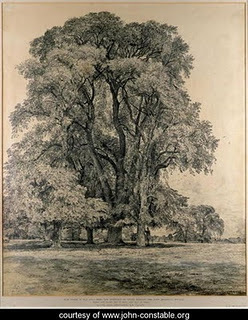 Here is another drawing by William Trost Richards (American, 1833-1905 ) showing the same technique. If you click on this for a larger view, you will note the beautifully organized areas of value which help create the illusion of volume in the foliage masses. So, squint down and look for the large value areas. To help you accomplish this, do a little sketch to map out those areas before you start your drawing or painting. This will help you see them as well as design them in a pleasing way. Here is an example of a value map. This kind of sketch can really help organize your values before you start. Here is another slightly more finished “value map”. As you can see, I have massed the lights and darks and also used mid tones to describe the planes of the foliage. When you look at foliage try to see those planes- where the light strikes the mass, where it turns away from the light, and where it is in shadow. If you squint you can see this clearly. Then the challenge is to “mass” those areas. Go outside and do a lot of observing of foliage until you begin to see the patterns. Do some simple value maps to gain experience with the idea of massing. Notice the direction of the light and how that affects the values you see. 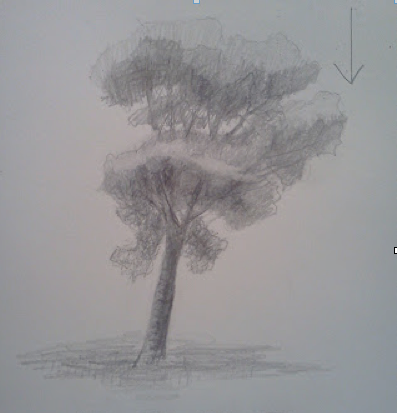 Here are two more simple “value map” drawings, the first showing top lighting and the second depicting lighting from the left top side of the tree. In both simplified drawings, I have identified the lights, mid tones and shadow areas by squinting down and also by simplifying those areas. In Nature, those values will not always be clearly organized. If you try to copy them as you see them, the result will look spotty and break up the solidity of your form. So learning to squint and simplify is the key to success. P.S. 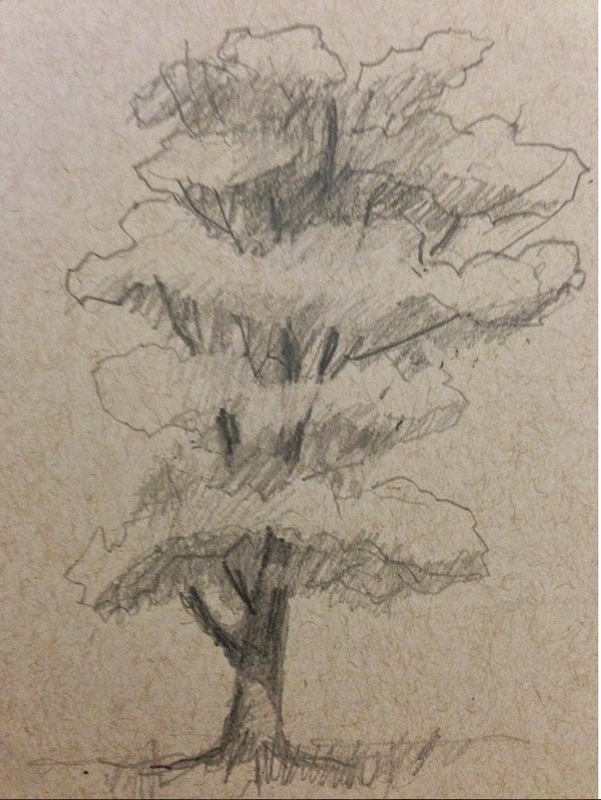 Our most popular online class, Drawing & Painting Trees, starts September 11th. 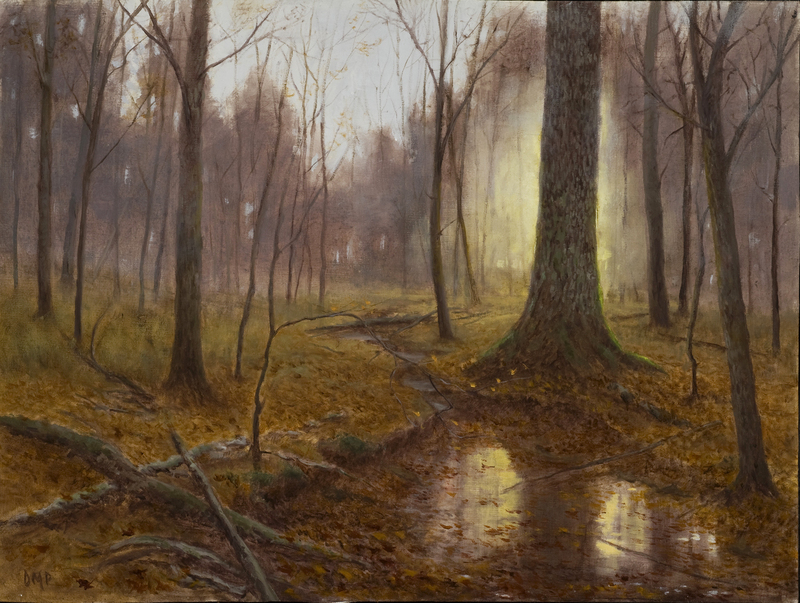 For landscape painters, trees are arguably the most important raw material of our craft and art. Join us! 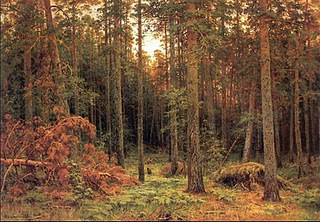 Ivan Shishkin (1832-1898) was a late nineteenth century Russian landscape painter. He is revered in Russia and has steadily become better known in the West. 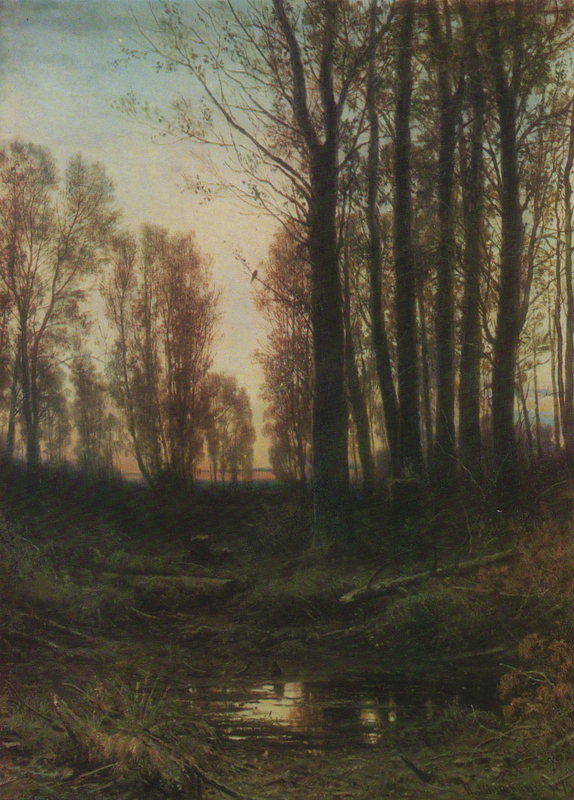 Shishkin received a classical painting education in Moscow and St. Petersburg, and also was the recipient of Imperial scholarships for study abroad. 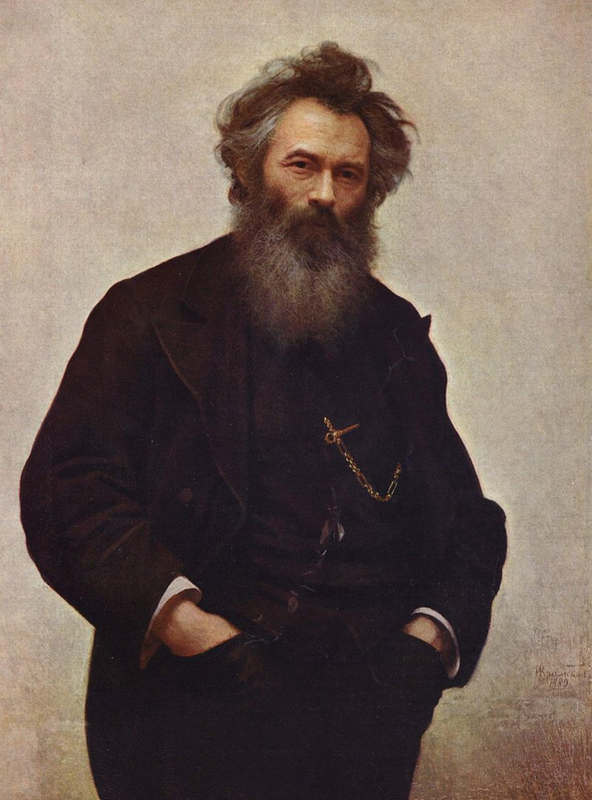 He was a contemporary of Isaac Levitan (my other favorite Russian) and they exhibited together as part of a group called the Itinerants. 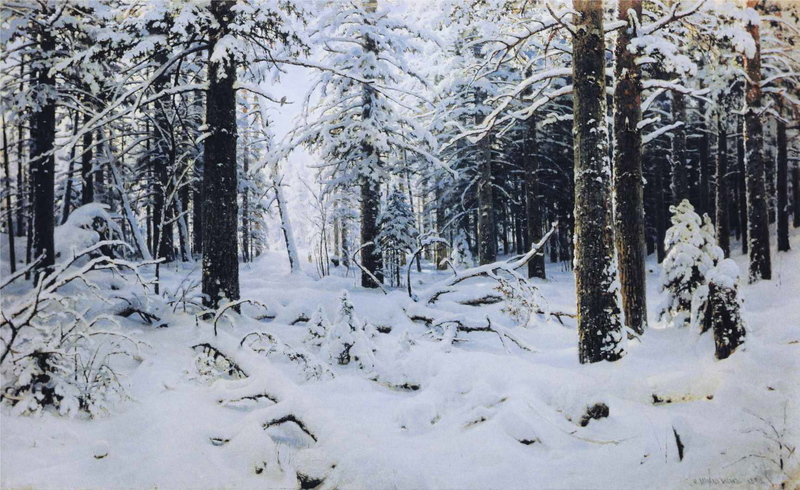 Shishkin is best known and loved for his forest scenes and was often referred to as “the poet of the forest”. This massive painting, approximately 65 x 99, was painted in the last year of the artist’s life! P.S. 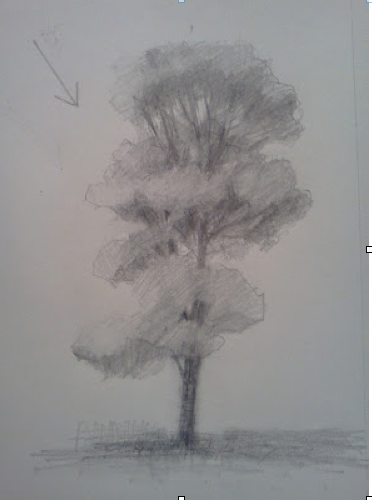 Our most popular online class, Drawing & Painting Trees, starts September 11th. 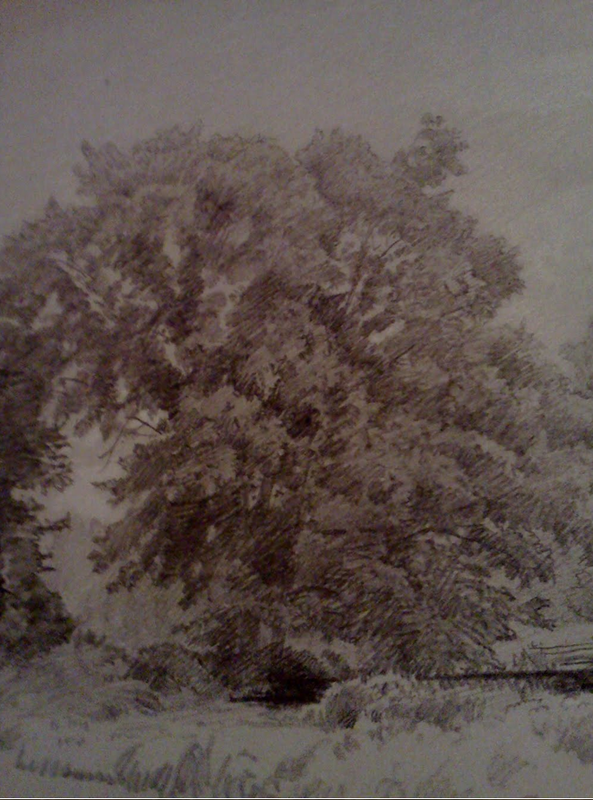 For landscape artists, trees are arguably the most important raw material of our craft and art. Join us! 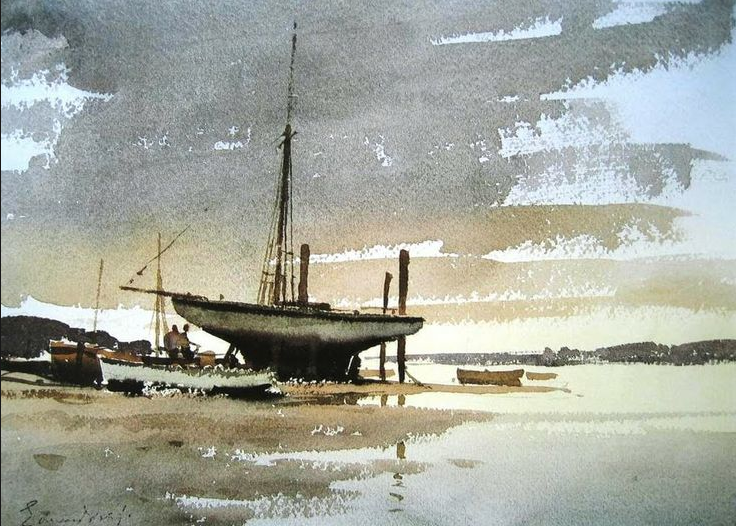 Edward Seago (1910-1974) was a British landscape painter. 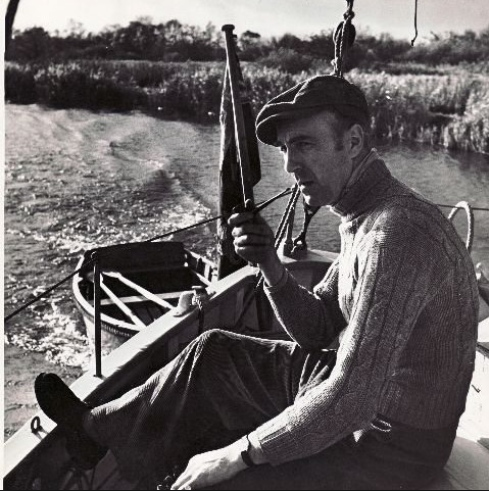 He is one of the best known and widely collected British artists of the 20th century. He enjoyed enormous popularity during his lifetime including royal patronage by several members of the Royal Family, including the the Queen Mother, the Duke of Edinborough and Prince Charles. 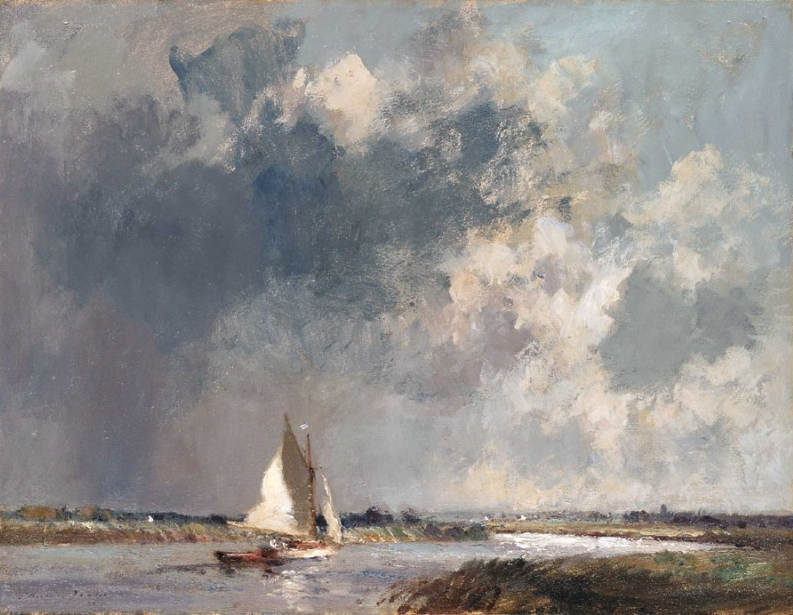 Seago painted all sorts of subjects, but is perhaps best known for his paintings of boats, skies and the countryside around his home in Norwich. He painted in watercolor and oil. 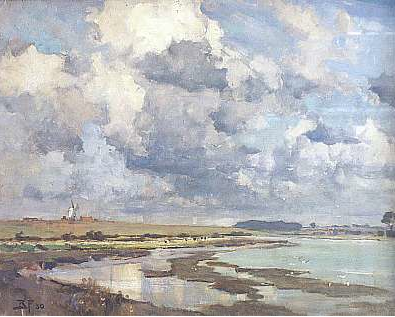 Although Seago was given some direction by Sir Alfred Munnings he was essentially a self taught artist. 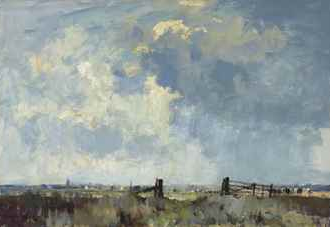 He studied the works of Constable particularly as well as other masters. Here are some beautiful Seago skies. 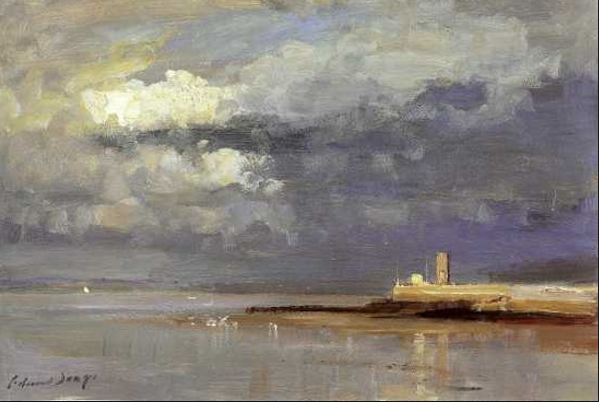 Notice how Seago carefully orchestrated his skies, playing the lights and darks against each other. Enjoy! P.S. Our upcoming online class The Painted Sky starts August 7th! 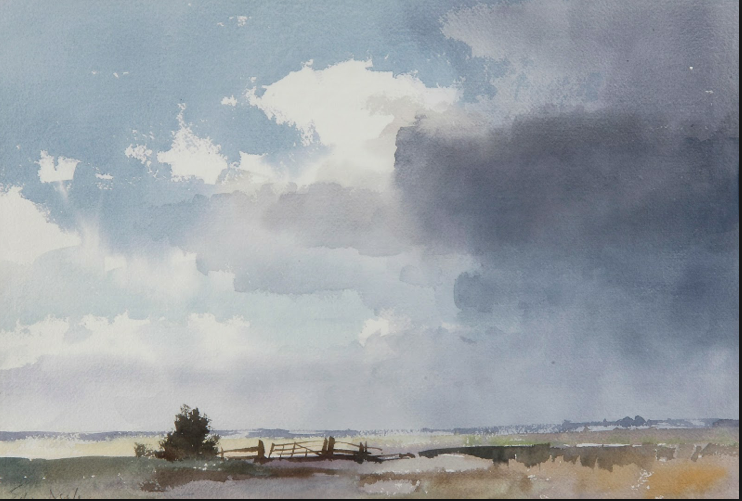 Take a look at our previous posts on painting big, atmospheric skies and join us! 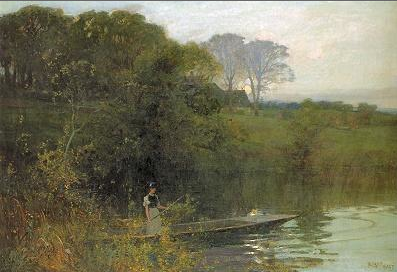 Sir Alfred Edward East (1844- 1913), was a British landscape painter whose work was influenced by the French Barbizon painters as well as the rich tradition of British landscape painting in the 19th century transmitted by the twin giants of the genre, Constable and Turner. Sir Alfred had a successful career, exhibiting at the Royal Academy and was given a knighthood by King Edward VII. Today, he is perhaps best remembered for his book The Art of Landscape Painting in Oil Colour which was published in 1906. 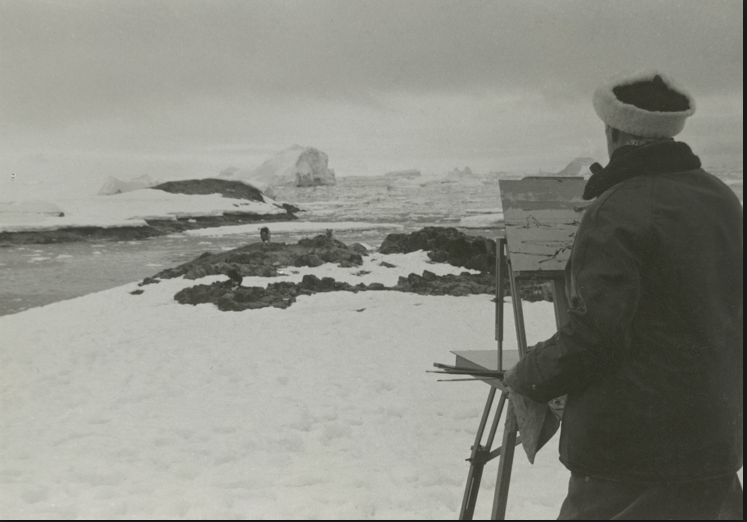 The book contains much of the conventional wisdom on landscape painting of the time, but is noteworthy in its emphasis on drawing, how to approach Nature, sketching and painting from Nature, and composition. The chapter on painting skies is particularly interesting, offering the beginning landscape painter sage advice delivered in a mixture of pithy directives and more lengthy (occasionally turgid) prose of the late 19th century. It is well worth reading. Here are a few of the best bits! 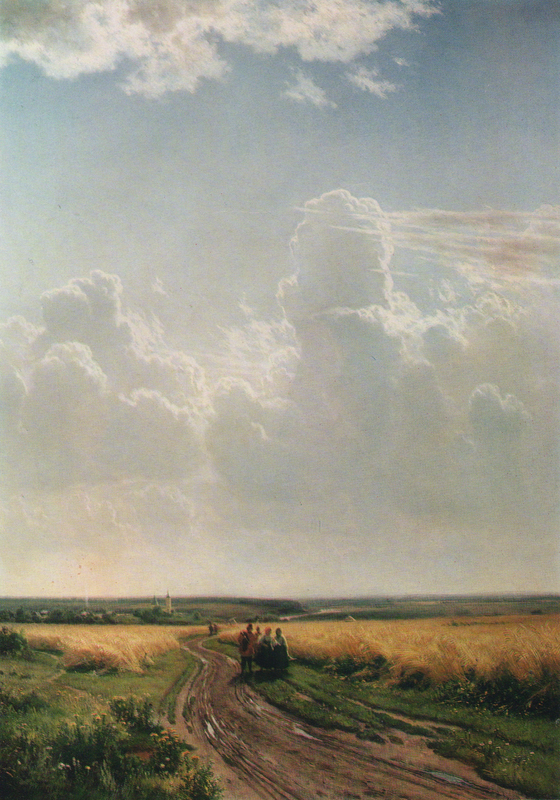 In his chapter on skies, East advises that “if you make a practice of painting a sky every morning with the regularity that you take your bath, you will find at the end of six months that you know something of its variations.” He suggests that thirty minutes is a sufficient amount of time, and that it should be done immediately before breakfast so that it doesn’t interfere with your “ordinary work”. A Kindle version of the book is available through Amazon. In Part I on this topic we explored the history of indirect painting. In this post, we’ll look at why indirect painting is different from direct painting – why it creates a different “look” and how it can be used to create an extraordinary range of optical effects. First, let’s talk about transparent paint. During my training as a landscape painter, I was not really given any information about transparent paints and what, if anything, they might be used for. In fact, I tended to think of them as a nuisance and to avoid them, because generally their tinting strength is lower. Like most direct painters, I vaguely understood that it was a good thing to keep the darks thin and the lights thicker. Eventually, as I began to explore indirect painting techniques, understanding the properties of transparent paint and how they can be used opened up a a whole new way of looking at the surface of a painting. Here is a diagram showing what happens when light strikes the surface of a directly painted work. The light strikes the surface of the painting and then bounces off. This mimics how light reaches our eyes on lit up form and is why opaque paint works so well to depict bright sunlight for example. Indirectly painted works, on the other hand, are composed of distinct layers of paint, some passages applied transparently as glazes, others applied translucently as scumbles or velaturas and others in opaque paint. All of these layers may be visible when one looks at the surface of the painting. So what happens when light strikes an indirectly painted work? Here’s a diagram. Essentially what happens is that light passes through the surface of the painting (rather than reflecting back as it does off an opaque paint surface) , strikes the ground or other opaque layer, and bounces back out, creating that “glow from within” look. So, when you combine different surfaces – all transparent, transparent glaze over an opaque layer, scumble over transparent, etc- you get all sorts of different effects because the light is entering and reflecting and refracting back in different ways on different parts of the painting surface. This creates an optically complex look that just cannot be gotten any other way. Because the light travels back through the layers, it enters the eye in a more diffused state and creates both a glow and luminosity that enhances the atmospheric look of the work. Shadows look deep, transparent and mysterious, scumbles create air and atmosphere, softly covering forms, and opaque passages look even more brilliant. In a way, looking at an indirectly painted work is a bit like an archaeological excavation – the viewer peers through layers of paint and time. The surface invites a long, lingering look. P.S. Our annual online class Painting the Luminous Landscape- Introduction to Indirect Painting for Landscape Painters- starts July 10th. Come see what all the fuss is about! Join us! Most of you are direct painters. This is the primary way that oil painting has been taught for the last century or so, although indirect painting held sway prior to that. I was trained to work in a direct, alla prima way as many of you have been. When I decided to explore indirect painting techniques, there wasn’t a lot of information out there, especially for landscape painters. So, it took years of research- study of past masters, as well as art history, and texts on methods and materials- to figure out a bit about this way of working. 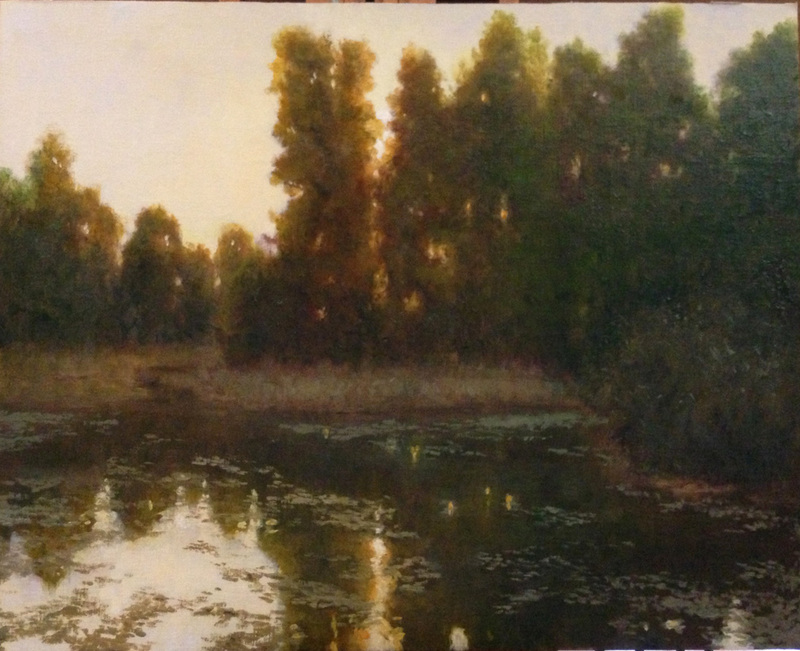 Even today, there are just a handful of landscape painters who are using these methods. Indirect painting simply means that the surface of the painting is built up in layers rather than all in one go. There are many different ways to do this. All of them rely on creating distinct layers of paint which will create a different optical effect, a different “look” than a work painted directly in opaque paint. This is achieved by using transparent, translucent and opaque passages and building up the painting in layers. Before we explore the technical side of indirect painting, let’s look at a little art history. Prior to the late 14th century, the medium of egg tempera was used for painting. The earliest oil painting technique was developed in Flanders in the late 14th and early 15th centuries. As a result this method is referred to as the Flemish technique. Using a wood panel, artists transferred a highly refined drawing onto the panel. The drawing was then restated in ink or thin paint and sealed with varnish. Once that was dry, the artist would commence painting transparent glazes into the shadows and applying layers of thin translucent or opaque paint into other areas. Each layer of paint was allowed to dry before continuing work and the painting was finished by adding subsequent glazes and building up the lights with opaque paint. Highlights were finally added with thicker opaque paint. This produced a highly realistic, more linear image, usually with fairly hard edges. 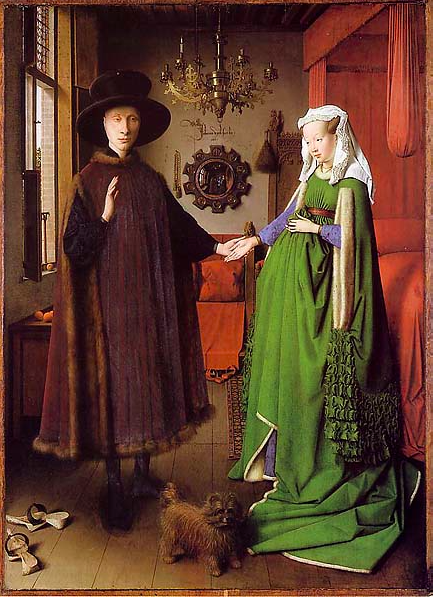 Here is a painting by Jan van Eyck (Flemish, 139-1441) executed in the Flemish technique. The new innovations of oil painting spread like wildfire throughout Europe. Italian artists in particular adopted the new medium although resistance by some (including Michelangelo) remained. 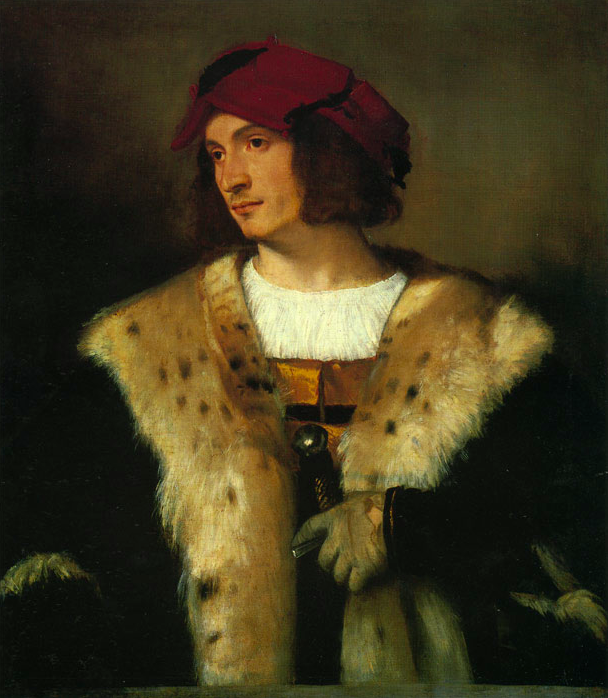 By the late 15th and early 16th centuries Venetian artists, particularly Titian (1488-1576) and Giorgione (c.1477-1510) began to invent further innovations to the Flemish technique. The limitations of working on wood panels and the difficulty of making alterations to a work in progress sparked a shift to the use of a canvas support and a more painterly process for execution which is called the Venetian technique. The innovations of the Venetian technique involved the use of canvas, stiff brushes and an underpainting rather than a drawing. As a result, the edges in paintings produced this way tend to be softer and the resulting work more atmospheric and painterly. Generally the underpainting was executed either partially or completely in opaque paint and was called a grisaille when executed in neutral greys. After the grisaille dried, glazes would be applied to the shadows and the light areas built up with thin opaque paints. 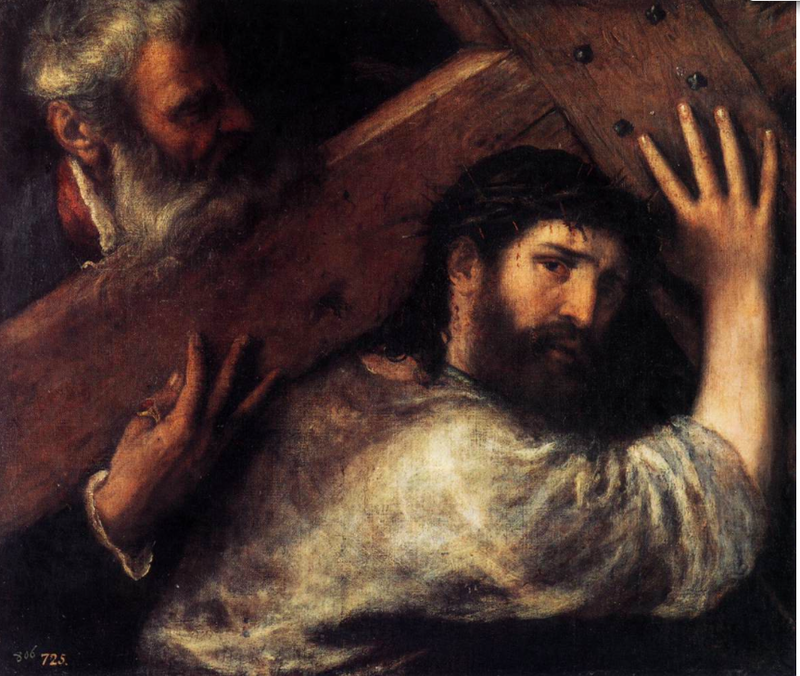 Titian is generally credited with “inventing” the scumble (light opaque paint applied as a translucent layer) and the velatura or semi-glaze which can be transparent or translucent. Eventually use of the Venetian method and its many variations became widespread all over Europe and was used for centuries by masters such as Rubens, Vermeer, Rembrandt, Poussin, and Ingres. Indirect painting, using the Venetian method or its many manifestations, offers the artist the widest range of options for both application of paint and optical effects which can be achieved. In Part II we’ll find how how and why!